仕覆 is Kanji(漢字) , Chinese style ideographs (characters). Note: If ever you're looking at text that looks Chinese but see this の swoopy thing, it is a dead give away that you are looking at Japanese and not Chinese. shifuku is Romanji , Japanese rendered in Roman (Latin) characters . しふく=シフク is hiragana (平仮名, ひらがな or　ヒラガナ)  which is the Japanese version of a phonetic alphabet. Note: To generate hirigana, you can use The Kanji Converter  which can also do romanji, but always be cautious of machine translations. The romanji I found through googling keywords , so I'm confident in that rendering. The other commonly used Japanese writing system is katakana (片仮名, カタカナ or かたかな) is usually used for words borrowed from other languages and onomatopoeia. Right, but you were expecting me to talk about tea bags, eh? 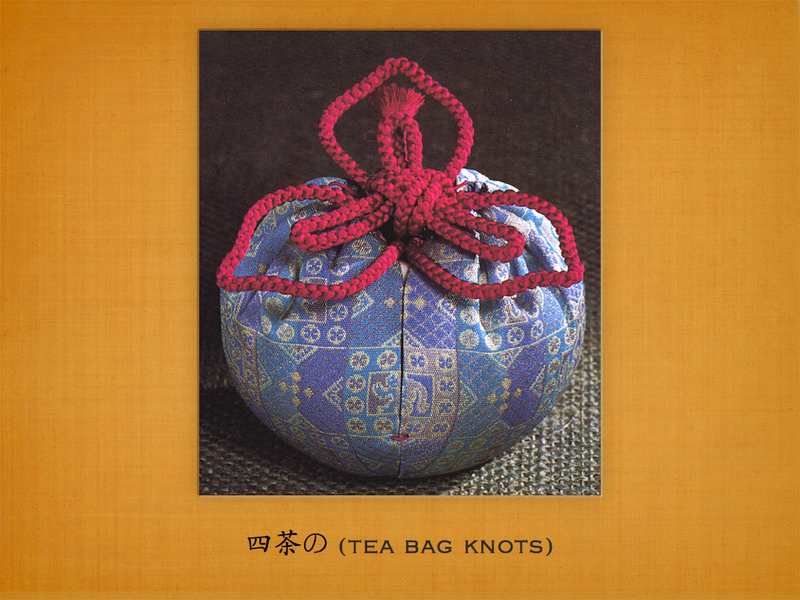 Tea being a precious thing, the Japanese of yore would store their tea in fabric pouches and tie elaborate knots so that they knew when their tea had been fiddled with. A lock of sorts. To this day, they still like the little bags with decorative knots tied on them (I've got at least 3 books on the topic). Are they just decorations these days? Do they actually hold tea? I can't say. Maybe someone who knows will set us straight. 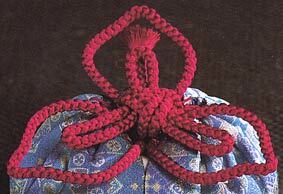 This particular knot is an iris knot.